The 1920’s and 30’s were a difficult time for rural America. The country was in the throes of an agricultural depression. Marginal and sub-marginal agricultural lands were being abandoned at an unprecedented rate. There were large problems with soil erosion on these abandoned lands. One of the larger questions of the day was what was likely to happen to these lands? You are standing in the center of one of the solutions to this problem! The State Reforestation Law of 1929 and the Hewitt Amendment of 1931 set forth the legislation which authorized the Conservation Department to acquire land by gift or purchase for reforestation areas. These Reforestation Areas, consisting of not less than 500 acres of contiguous land, were to be forever devoted to “reforestation and the establishment and maintenance thereon of forests for watershed protection, the production of timber, and for recreation and kindred purposes”. These Reforestation areas became the nucleus of our present day State Forest System. 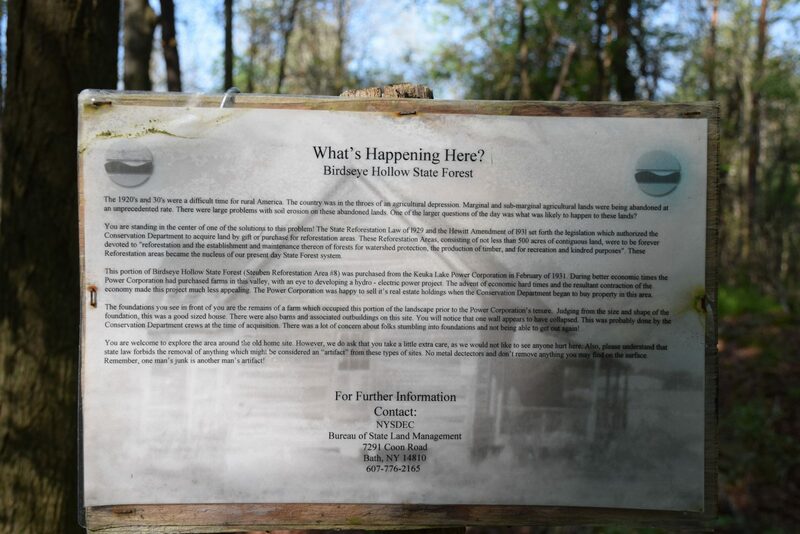 This portion of Birdseye Hollow State Forest (Stueben Reforestation Area #8) was purchased from the Keuka Lake Power Corporation in February 1931. During better economic times the Power Corporation had purchased farms in this valley, with an eye on developing a hydro-electric power project. The advent of economic hard times and the resultant contraction of the economy made this project much less appealing. The Power Corporation was happy to sell its real estate holdings when the Conservation Department began to buy property in this area. The foundations you see in front of you are the remains of a farm which occupied this portion of the landscape prior to the Power Corporations tenure. Judging from the size and shape of the foundation, this was a good sized house. There were also barns and associated outbuildings on this site. You will notice that one wall appears to have been collapsed. This was probably done by the Conservation Department crews at the time of acquisition. There was a lot of concern about folks stumbling into foundations and not being able to get out again! You are welcome to explore the area around the old home site. However, we do ask that you take a little extra care, as we would not like to see anyone hurt here. Also please understand that state law forbids the removal of anything which might be considered and “artifact” from these types of sites. No metal detectors and don’t remove anything you may find on the surface. Remember, one man’s junk is another man’s artifact!